Lindt and Sprungli - Swiss Master Chocolatier Since 1845. Do you dream in chocolate? Then discover LINDOR and enjoy a moment that is yours: When you break LINDOR's delicate chocolate shell, the irresistibly smooth filling starts to melt, gently caressing all your senses and taking you to a place where chocolate dreams come true. Discover the exquisite taste of Lindor, the sensuous Truffles with delectably smooth fillings that will melt your or your friends heart. 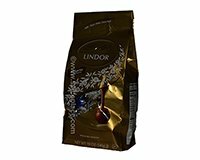 Lindor Truffles are inspired by the legendary craftsmanship and uncompromising quality of the Lindor Chocolatiers. Allergy Information: May contain traces of peanuts and/or tree nuts. Store in a cool (60-68° F) and dry place. Made in USA by Lindt and Sprungli (USA) Inc, Stratham, NH 03885.